Aaron Dunne Tyre Services provides a high-quality, value-for-money 24/7 mobile tyre repair and replacement service to commercial and agricultural vehicle owners across the midlands and beyond. We travelled to Aaron’s Mountmellick, County Laois base to find out more about this exceptional, progressive operation. Since its inception in May, 2009, Aaron Dunne Tyre Services has been offering commercial (and agricultural) vehicle owners unrivalled tyre solutions. 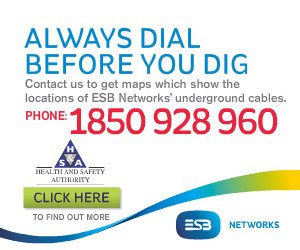 By calling to the operator’s home or place of work –or to the side of the road, as is often the case! –the Laois man removes all the hassle out of having tyres replaced and fitted, with wheels balanced as an extra service for no additional cost. The business has thrived on the back of supplying premium products and service levels; Aaron is determined to continue to provide his customers with the best possible service when it comes to all things tyre-related. To this end, he invested in a brand-new 161-reg Iveco service van earlier this year and, at the time of writing, was also in the process of acquiring a state-of-the-art mobile laser alignment system. Aaron is on call literally 24/7 and prides himself on getting to his customer in double-quick time, be it a tractor, combine, truck or trailer tyre that’s playing up: “We go out whenever the customer calls. If a farmer or contractor calls, I can usually mend the tractor tyre without taking it off and get him back up and running with a minimum of fuss. Of course, not everybody carries cash around with them these days so Aaron makes payment convenient by carrying a mobile credit card machine with him on all call-outs. 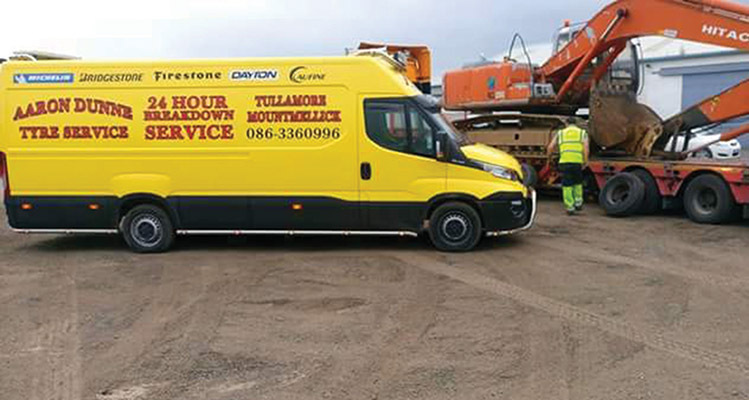 Stocking a comprehensive range of premium truck, van and agricultural tyres at all times –including the likes of Bridgestone, Firestone and BKT Agrimax –Aaron Dunne Tyre Services can guarantee a response that is prompt, dependable and reasonably-priced. The new 161-reg Iveco van –which is essentially a mobile tyre workshop - is well kitted out with the best equipment that money can buy (with all compressors and tools etc. purchased from Air Impact Ltd. in Thurles), while Aaron also runs a Nissan jeep for access to tractors and agri machinery on rougher terrain. At the moment, it’s a one-man operation but this could be set to change sooner rather than later, with the arrival of a new mobile 3D laser wheel alignment system imminent. This will be used to re-set the direction and angle of wheels on trucks and trailers to the specifications recommended by vehicle manufacturers. As truckers are understandably very particular and conscientious about every aspect of their vehicles, tyres included, only the very highest standard of service will suffice. “Everything has to be 100%, especially with the RSA monitoring the haulage sector, and I wouldn’t have it any other way,”says Aaron. “I understand that they want perfection and that’s what I strive to deliver. You could have trucks that are doing continental work and you have to be vigilant of the fact that they might be going to a warmer climate –if there’s any sort of gash on a tyre it will have to come off. At the end of the day, everything is geared toward safety and I won’t take any chances with the welfare of my customers or their loads. It’s a policy that has served Aaron Dunne Tyre Services well since its inception and the signs are encouraging that there are a few chapters remaining to be written in this particular success story.